Background: Strategies to prevent anaemia in preterm infants include drawing fewer blood samples, the use of recombinant human erythropoietin and iron supplementation. Although iron sulfate is the most commonly used pharmaceutical formulation for iron supplementation, there are few studies comparing different iron salts in infants. Objective: This is a study of retrospective data comparison of two groups of preterm infants receiving erythropoietin to evaluate the efficacy of iron bisglycinate chelate to iron sulfate. 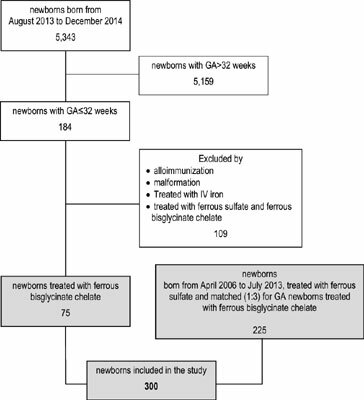 Subjects and Methods: Three-hundred infants of gestational age ≤32 weeks were enrolled: 225 were supplemented with iron sulfate (3 mg/kg/day) and 75 were supplemented with iron bisglycinate chelate (0.75 mg/kg/day). The effect on erythropoiesis was assessed with a general linear model that estimates the response variables (values for Haemoglobin, Haematocrit, absolute values and percentage Reticulocytes, Reticulocyte Haemoglobin content) based on treatment, time, birth weight, and gestational age. Results: Supplementation with iron bisglycinate chelate at a dose of 0.75 mg/kg/day demonstrated an efficacy comparable to iron sulfate at a dose of 3 mg/kg/day in both populations of preterm infants. The two cohorts had similar erythropoietic response, without significant differences. Conclusions: The higher bioavailability of iron bisglycinate chelate resulted in a lower load of elemental iron, a quarter of the dose, and achieved equivalent efficacy compared to iron sulfate. Iron bisglycinate chelate may appear to be an alternative to iron sulfate in the prevention and treatment of preterm newborn anaemia. Preterm newborn anaemia, iron sulfate, bisglycinate chelate, treatment, haemoglobin, Iron deficiency.